We have decided to be all grown up about life, the husband unit and I. We will be having a Saturdate and visiting different restaurants each week, trying something new on for size. We’ve been looking at apartments this past week, visiting a whole heap of places only to realize that we are comfortable where we are. But we are keeping an outlook for something bigger and cheaper than what we have, which means looking outside of Stockholm. A two bedroom apartment would be ideal but we are more than ready to settle for a large one bedroom as well. But we are comfortable here for the time being and we both like our place. So we have an interesting time ahead of us, deciding what to do and where to go. But for now we’re staying put and loving it. 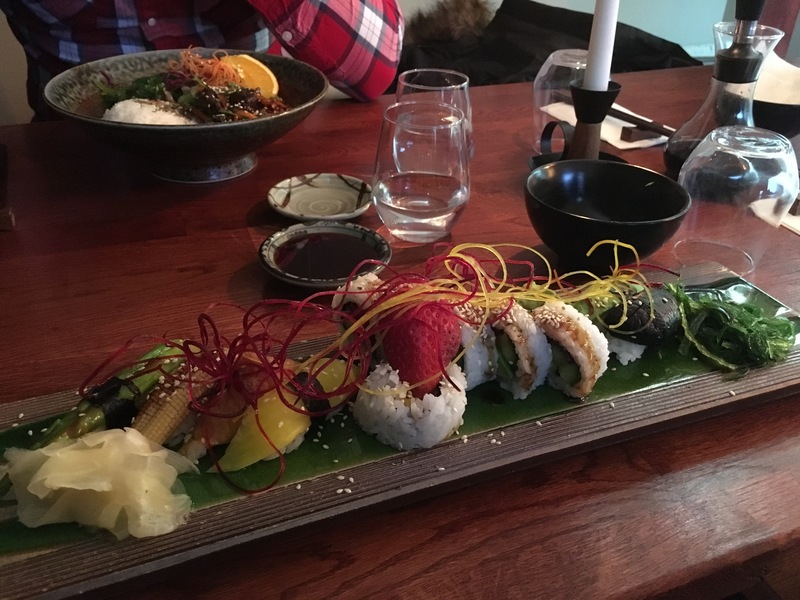 Tonight’s dinner date, or Saturdate as it were, was at Esuki Sushi in Solna. We’ve been there a few times and not once have we walked out of there not completely stuffed and satisfied. Since I’m pregnant I feel like not having to ask about what’s what and go for the safe option- vegetarian sushi. Usually the vegetarian option is boring and underwhelming but this place has me coming back for more. It’s an innovative feast not only for your pallet but also for the eye. Incorporating such ingredients as shiitake mushroom, baby corn and asparagus. The given ones are there as well, namely avocado and tofu. I devoured the 12 piece while the hisband ate away at his Yakiniku, which is his favorite dish in that place. We rolled out afterwards, happy as clams and stuffed at the rafters. The place is by far the best I’ve been to in terms of sushi and the terrible parking situation would usually put us off of it but the food is absolutely spectacular and the place is cute and cosy. 🐥🐥🐥🐥🐥 (five hatched chickens out of five, making it a grand slam).